Orge Biologique, Sucre, Sel, Extrait de Levure, Herbes et éspice, Ail et oignon déshydratés, huile d'olive, Arôme, Naturel (blé). 1. HEAT 1 Tbsp. (15 mL) of the olive oil in a large nonstick skillet over medium-high heat and cook your steak 3 minutes or until desired doneness. REMOVE from the skillet and set aside. 2. ADD another 1 Tbsp. (15 mL) of the olive oil to the same skillet and cook your peppers and onions 5 minutes. REMOVE everything from the skillet and set aside with your steak. 3. 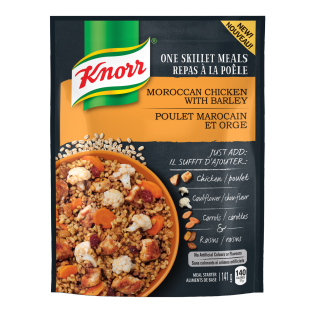 ADD remaining olive oil, water and contents of Knorr® One Skillet Meals to the same skillet and bring to a boil. Cover, turn down the heat to medium-low and simmer 22 minutes or until rice is tender. 4. STIR in your reserved steak, peppers and onions. Remove from heat and let stand covered 2 minutes. Now it's delicious, dig in!